In complicated cases, anatomical anomalies, operation history, and specific tumor location could probably result in surgeries with high difficulty and potential complications. Since its first introduction in 1982, intraoperative laparoscopic ultrasonography (ILUS) has been used in urology and has gradually shown its advantage. 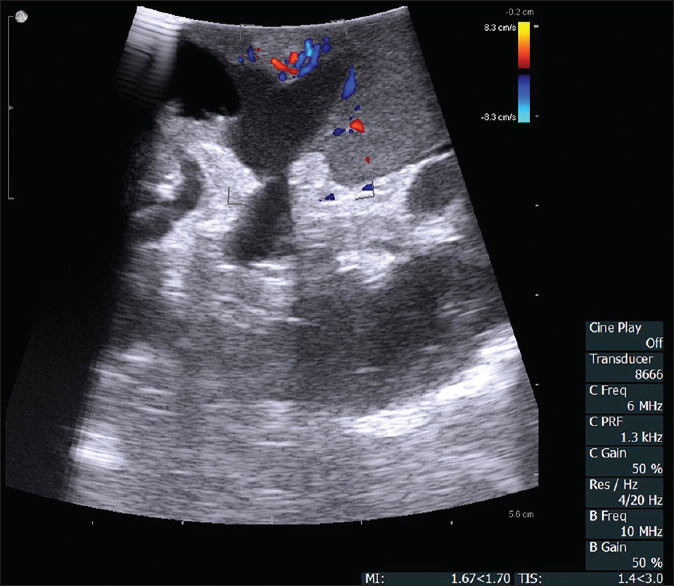 Doppler integrated into laparoscopic ultrasound allows for real-time presentation of anatomy in surgeries. Although there are articles discussing its usage in laparoscopic surgeries,,, reports in RLPN are few, especially the ones dedicated in complex cases and with relative long-term and complete follow-up results. The present study aims to describe our technique and summarize our experiences of ILUS in RLPN. We hope to provide relevant skills and experiences with ILUS to enable the urologist to better conduct puzzling and difficult retroperitoneal laparoscopic nephron-sparing surgeries. An institutional retrospective review has been approved by the ethics committee in our hospital to present the study of RLPN with ILUS. Informed consent has been obtained after necessary information was declared to the patients. RLPN was performed by the same major urologist, Nianzeng Xing, with different assistants. Perioperative data were collected independently by two researchers and discussed to be integrated into one when presented with inconsistencies. Routine hematological, biochemical examination, X-ray chest, abdominal ultrasonography, and abdominal CT/magnetic resonance imaging were assessed preoperatively. ILUS and its initial application in RLPN in our department have been introduced in another article published in 2012. Aloka 4000 (Aloka Co., Ltd., Tokyo, Japan) ILUS machine and its matching probe (UST-5536-7.5 Ultrasound; Aloka) were applied in all cases. Surgical procedures have been standardized by the operator. After general anesthesia, ureteral stents might be placed for the tumors near the renal hilum with the guidance of cystoscopy, through which renal pelvis could be transfused with methylene blue when the suspicion of collecting system damage existed. With trocars placed and retroperitoneal space established, the surgeon opened the Gerota's fascia, and a probe could be applied to facilitate the location of the main renal artery and the accessory ones if suspicion existed. After identification of the tumor, characteristics of the tumor were compared and integrated with preoperative information, including size, location, blood supply, distance to the renal pelvis, possible pathology, and possible satellite tumors. With the confirmation of the information above, the urologist delineated the tumor with sufficient normal tissue under the guidance of ILUS and resected it after the bulldog clamp discontinued the blood flow shown by the ILUS [Figure 1]. The incision was sutured with 3-0 Vicryl (Ethicon Endo-Surgery, Johnson and Johnson) in the inner plane or the renal pelvis and 2-0 Vicryl in the outer plane. The blood supply of the kidney was restored without the bulldog clamp. After confirmation of the blood supply by the ILUS, the specimen was extracted and the incisions were sealed. The perioperative information of the recent 199 cases receiving RLPN with ILUS was retrospectively reviewed and analyzed. Preoperative information collected were age, gender, tumor features, preoperative clinical diagnosis, and so on. Operative data comprised operative time, estimated blood loss (EBL), warm ischemia time (WIT), tumor features according to the ILUS, and so on. Postoperative information included complications, postoperative hospital days, the pathology of the tumors, and follow-up results. The data were presented as mean ± standard deviation with range for the continuous data with normal distribution and median and interquartile range for those not. One-sample Kolmogorov–Smirnov test was applied to assess whether the data are normally distributed or not. Statistical analysis was completed by Statistical Package for the Social Sciences, version 24.0 (SPSS Inc., Chicago, IL, USA). From 2013 to 2018, 199 patients who received RLPN with ILUS were reviewed for this study. RLPN was performed by one major urologist, Nianzeng Xing, with various assistants. Preoperative information is shown in [Table 1], and operative and postoperative information is shown in [Table 2]. RLPNs were all successfully completed without conversion to open surgery. All surgeries were completed in 90.2 ± 21.7 min, with 73.6 ± 89.2 mL for EBL, and 19.3 ± 5.6 min for WIT. The drainage days and postoperative hospital days were 4.7 ± 2.3 and 6.1 ± 2.3, respectively. Moreover, the preoperative creatinine was 69.7 ± 19.4 μmol/L compared with 79.9 ± 25.3 μmol/L on the postoperative 1st day and 61.6 ± 12.7 μmol/L on the postoperative 1 month. One patient was conversed to retroperitoneal laparoscopic radical nephrectomy because of renal pelvis invasion of the tumor shown by ILUS, which was not clearly detected by preoperative CT scan. Four patients were evaluated as Bosniak category III cysts by CT scan preoperatively. Two of them were assessed as more possibility of malignancy than benign by the ILUS intraoperatively. They were judged as clear-cell RCC by intraoperative frozen-section examination and received RLPNs thereafter. The remaining two were in the opposite situation and received renal cyst unroofing. There was one patient whose kidney showed no blood supply by the ILUS after the sutures of the renal incision were completed. Therefore, the surgeon conducted anastomosis of the subsegmental renal artery and main renal artery. After that procedure, the ILUS confirmed blood reperfusion and the surgery was successfully completed. There were no complications in relation to ILUS before, during, and after RLPN. Fifteen (7.54%) patients suffered from postoperative complications in this study, with abdominal pain in three patients, fever in six patients, urinary infection in four patients, and pulmonary infection in two patients. All these complications were treated well with conservative or anti-inflammatory therapy. There were no long-term complications (>90 days) present [Table 3]. The pathological reports showed that there were 149 cases of clear-cell RCC, 9 cases of chromophobe RCC, 7 cases of papillary RCC, 4 cases of oncocytoma, 23 cases of angiomyolipoma (AML), 2 cases of multilocular cystic RCC, 3 cases of renal cyst, 1 case of inflammatory lesion, 1 case of adenofibroma, and 2 cases of Xp11.2 translocation. 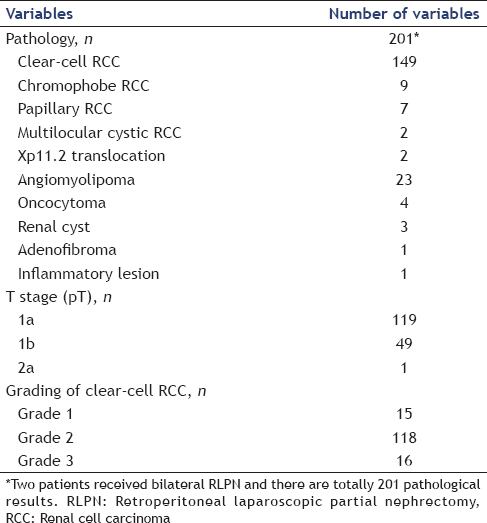 Of all the clear-cell RCC cases, there were 15 cases of Grade 1, 118 cases of Grade 2, and 16 for Grade 3. As for the papillary RCC, there were 5 cases of Type 1 and 2 cases of Type 2. In all 169 malignant pathological results, 119 cases belonged to pT1a, 49 cases belonged to pT1b, and 1 case belonged to pT2a. Detailed information is shown in [Table 4]. Twelve cases of satellite tumors were confirmed by pathological results, of which 8 were not detected by preoperative examinations and finally found by ILUS during surgeries. As reported in this study, there were 17 cases of RCC no more than 1 cm, and they were resected without artery clamp or a large amount of blood loss. During the median postoperative follow-up of 42 months, the relapse-free survival rate and the overall survival rate were 99.0% and 100%, respectively. Of the 199 patients, a total of 15 patients were lost to follow-up. Two patients relapsed postoperatively during which one patient was pathologically diagnosed with clear-cell carcinoma and lung metastasis and received target therapy, while the other patient was pathologically diagnosed with AML and received regular observation. Between 2013 and 2018, ILUS was applied in RLPNs and relative experiences were summarized. In this article, the authors described the experiences and its advantages in various situations in partial nephrectomy. Combined with preoperative CT and preoperative ultrasonography, ILUS can present additional real-time information to recuperate the surgeons' tactile feedback about the size, nature, number, peripheral organs and tissue, and location of the tumor in certain cases. Moreover, ILUS can provide higher resolution of the image that surgeons focused on than that of the standard transcutaneous abdominal ultrasonography as well as CT.
As an indispensable procedure, renal artery clamp is essential to the success of RLPN. Accessory renal arteries exist in certain population, and preoperative CT cannot identify each one of the arteries. Moreover, preoperative CT cannot precisely indicate the location of the arteries, especially after manipulation and dissection in surgeries. In addition, various anomalies, different position during surgeries and CT, and various tumor characteristics may pave a rough road to RLPN. Once injuries of blood vessels occur, major complications or conversion is inevitable to the surgeons, anesthetists, and patients who are confronted with it. To tackle this dilemma, tentative surgical techniques or ILUS is badly needed for vascular control in RLPNs, which helps shorten operative time and provides high resolution of anatomy to the surgeons. In general, only after occlusion of the main renal arteries, RLPN can be implemented by the surgeons. In certain cases, highly selective renal blood control is an inevitable step to achieve surgical success. Some articles have declared that highly selective artery control could result in advanced renal function compared to without it., In this study, when segmental renal arteries were required, ILUS, an essential tool, was a remover of obstacles and clearly showed the segmental renal artery that the surgeons needed. Although preoperative CT usually showed tumor characteristics, such as tumor boundary, ILUS still played a key role in delineating the boundary between the tumor and the surrounding tissue, especially during surgical movements. In RLPNs, posterior tumors were relatively easier to be resected than the anterior ones. ILUS was absolutely necessary for certain circumstances as follows. While RLPNs for anterior tumors must be implemented just as for posterior ones, reposition of the kidney inevitably lowers the applicability of the information provided by preoperative imaging. For tumors near the renal hilum and internal renal tumors with intricate boundary, local anatomy might be altered by pneumoperitoneum and collapsed collecting system after renal artery control. Patients with operation history, especially urinary ones, were associated with complex surgical steps to tackle disordered local tissue cautiously. In these complicated situations, ILUS could be used repeatedly when the surgeon was irresolute of the local anatomy. Moreover, potential complications could be reduced when ILUS was used in circumstances as narrated above. Small and flexible probe of ILUS could detect an overwhelming majority of complicated structures during the operation. The preoperative surgical plan could be changed accordingly due to this technique. In this study, no complications were induced by this technique. As was reported previously, satellite lesions exist in renal tumors. This center had published that there were no satellites in that study. However, in the following cases, 12 cases of satellite tumors have been confirmed by pathological results. It was a remarkable fact that 8 out of 12 cases had not been detected by preoperative examinations and finally found by ILUS during surgeries. To remove tumors with 5–10 mm of renal parenchyma, satellite lesions should be detected and excised by the urologists. For this reason, not only renal tumors were routinely inspected by ILUS, but also the rest of the kidneys were scanned in this study. Malignant tissue including renal tumors and satellite lesions should be resected integrally with negative margin. On the other hand, the more renal parenchyma that was preserved, the more renal function that was probably retained., Without ILUS, urologists have to excise more tissue than sufficient to ensure a negative pathological result. While ILUS was applied to define the surgical location, and figure out whether there was invasion to the collecting system, and satellite lesions around the tumor, especially for intraparenchymal tumors and the ones near renal hilum,,, fine surgical movement and surgical plan alteration may still come into reality. Preoperative medical imaging could not make a definite diagnosis in certain renal tumors. Owing to relatively low spatial resolution of CT and indirect transduction of ultrasound, extra information is badly needed in surgeries without definite diagnoses and the affirmative operative procedures. As shown in [Figure 2], the ILUS scanned a lesion inside the kidney and indicated the possibility of malignancy. However, the preoperative CT provided only a vague imaging evidence to the clinicians and brought greater difficulty to us for the accurate diagnosis. As a result, we determined to implement RLPN and completely resected the tumor with the help of ILUS. Postoperative pathological results showed that the tumor was a renal cyst combined with clear-cell RCC, Grade 1. Renal tumors no more than 4 cm are classified as small RCC., With the development of medical imaging, 2 cm might also be kept as a threshold of small renal lesion according to our experience. For lesions no more than 2 cm, renal artery clamp might not be necessary, but the tumors are intricate and must be located and resected precisely during surgeries. To eradicate malignant tissues and protect the renal parenchyma, perirenal fat should not be peeled off especially close to the tumor, which facilitates manipulation of the tumor and the kidney. Preoperative CT usually indicates tumor characteristics including location, but after dissection, vague location might become the reality that surgeons are confronted with., In this study, there are 17 cases of RCC no more than 1 cm, and they were resected without artery clamp or a large amount of blood loss. ILUS was essential and necessary in these 17 surgeries for its convenience, high accuracy, and low cost. When it comes to functionally solitary kidney or isolated kidney, RLPN may pose a more severe position to the patients and doctors for its relatively poor function. ILUS should be applied in case that negative margin dominates the surgical movement to resect more than necessary parenchyma. After sutures of the renal incisions, the ILUS should be applied to detect the renal blood supply in the medical center for an event. As reported above, the renal blood supply of one patient could not be detected. The reason why there was no blood reperfusion is still unknown to the surgeons, but the view that ILUS should be applied with full-scale necessity after sutures is engraved to the mind of clinicians in this center although the incidence of similar events is sheer low. ILUS could show significant advantages for the assessment of tissue and vascular control for abdominal organs. In this cohort, no positive surgical margin has been reported with the facilitation of ILUS to some certain degree. In summary, with ILUS demarcating the boundary of the tumor simultaneously and careful practice, negative surgical margins can be achieved by experienced urologists, so that more renal parenchyma can be preserved for the patient. In general, ILUS is a vital and convenient tool to guide RLPN in multiple respects with relatively high resolution and rare concomitant complications. There are several limitations existing in this article for its retrospective, single-surgeon, and single-center study design. Moreover, surgical experience was a subjective factor that cannot be neglected and quantified. However, due to the large quantity of sample size, comprehensive description of relatively rare cases, and long-term follow-up, this study exhibited the particular experience and surgical application of ILUS to promote further development of this technique. This research was financially supported by the Capital Science and Technology Leading Talent Project (Project number: Z181100006318007). Rinott Mizrahi G, Freifeld Y, Klein I, et al. Comparison of partial and radical laparascopic nephrectomy: Perioperative and oncologic outcomes for clinical T2 renal cell carcinoma. J Endourol 2018;32:950-4. Doerfler A, Cerantola Y, Meuwly JY, et al. Ex vivo ultrasound control of resection margins during partial nephrectomy. J Urol 2011;186:2188-93. Ren T, Liu Y, Zhao X, et al. Transperitoneal approach versus retroperitoneal approach: A meta-analysis of laparoscopic partial nephrectomy for renal cell carcinoma. PLoS One 2014;9:e91978. Hyams ES, Perlmutter M, Stifelman MD. A prospective evaluation of the utility of laparoscopic Doppler technology during minimally invasive partial nephrectomy. Urology 2011;77:617-20. Kaczmarek BF, Sukumar S, Kumar RK, et al. Comparison of robotic and laparoscopic ultrasound probes for robotic partial nephrectomy. J Endourol 2013;27:1137-40. Alenezi AN, Karim O. Role of intra-operative contrast-enhanced ultrasound (CEUS) in robotic-assisted nephron-sparing surgery. J Robot Surg 2015;9:1-10. Kang N, Niu Y, Zhang J, et al. Intraoperative ultrasonography: A useful tool in retrolaparoscopic nephron-sparing surgery. Urol Int 2012;88:338-42. Kaczmarek BF, Sukumar S, Petros F, et al. Robotic ultrasound probe for tumor identification in robotic partial nephrectomy: Initial series and outcomes. Int J Urol 2013;20:172-6. Meng X, Mi Q, Fang S, et al. Preoperative evaluation of renal artery anatomy using computed tomography angiography to guide the superselective clamping of renal arterial branches during a laparoscopic partial nephrectomy. Exp Ther Med 2015;10:139-44. Lanchon C, Arnoux V, Fiard G, et al. Super-selective robot-assisted partial nephrectomy using near-infrared flurorescence versus early-unclamping of the renal artery: Results of a prospective matched-pair analysis. Int Braz J Urol 2018;44:53-62. Desai MM, de Castro Abreu AL, et al. Robotic partial nephrectomy with superselective versus main artery clamping: A retrospective comparison. Eur Urol 2014;66:713-9. Hyams ES, Kanofsky JA, Stifelman MD. Laparoscopic Doppler technology: Applications in laparoscopic pyeloplasty and radical and partial nephrectomy. 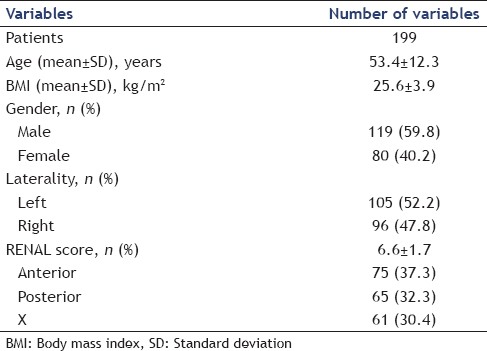 Urology 2008;71:952-6. Xu B, Zhang Q, Jin J. Retroperitoneal laparoscopic partial nephrectomy for moderately complex renal hilar tumors. Urol Int 2014;92:400-6. Mir MC, Ercole C, Takagi T, et al. Decline in renal function after partial nephrectomy: Etiology and prevention. J Urol 2015;193:1889-98. Doerfler A, Oitchayomi A, Tillou X. A simple method for ensuring resection margins during laparoscopic partial nephrectomy: The intracorporeal ultrasonography. Urology 2014;84:1240-2. Nadu A, Goldberg H, Lubin M. Laparoscopic partial nephrectomy (LPN) for totally intrarenal tumours. BJU Int 2013;112:E82-6. Chung BI, Lee UJ, Kamoi K, et al. Laparoscopic partial nephrectomy for completely intraparenchymal tumors. J Urol 2011;186:2182-7. Autorino R, Khalifeh A, Laydner H, et al. Robot-assisted partial nephrectomy (RAPN) for completely endophytic renal masses: A single institution experience. BJU Int 2014;113:762-8. Boorjian SA, Uzzo RG. The evolving management of small renal masses. Curr Oncol Rep 2009;11:211-7. Wang XZ, Yu ZX, Guo RJ. Application of laparospic ultrasonography in surgery of small renal cell carcinoma. Asian Pac J Cancer Prev 2014;15:9113-6. Bhosale PR, Wei W, Ernst RD, et al. Intraoperative sonography during open partial nephrectomy for renal cell cancer: Does it alter surgical management? AJR Am J Roentgenol 2014;203:822-7. Pautler SE, Choyke PL, Pavlovich CP. 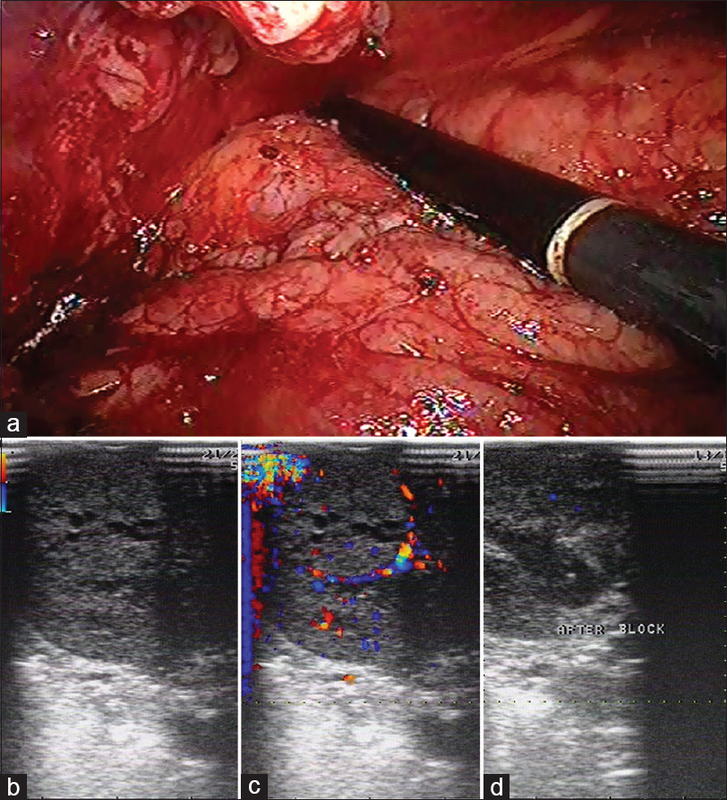 Intraoperative ultrasound aids in dissection during laparoscopic partial adrenalectomy. J Urol 2002;168:1352-5. Veeratterapillay R, Bromby A, Patel A, et al. Intraoperative and surgical specimen (ex vivo) ultrasound in the assessment of margins at partial nephrectomy. Int Urol Nephrol 2015;47:1665-9. Matin SF, Gill IS. Laparoscopic ultrasonography. J Endourol 2001;15:87-92.